Sooo…this is what it looks like to be a real vegetarian on a college student’s budget (“real,” meaning that I’ve been eating meat-free for about 15 years and I don’t only eat salads and kale). With that in mind, I’d like to point out that I am a religious carb-eater. Because of this, many people ask me, “If you only eat carbs, how are you not overweight?” The answer is simple—portion control (and I don’t only eat carbs). Is it absolutely 100%, perfectly healthy? No, but I do take my multivitamins and iron supplements every day while also visiting my doctors regularly, just like everyone else. Trust me, all of my doctors know that I’ve been a vegetarian for this long, especially since I’ve been going to some of them for most of my life. They have never once been concerned about my health, weight, or lifestyle. So neither should you. Now that that’s out of way, I’d like to talk about maintaining my vegetarian diet while also currently suffering from “broke college girl” syndrome. Living away at college was tough for me to adjust to—my mom wasn’t there to cook any specialty meals for me anymore and the dining hall at my school only offered pizza, salads, and french fries as vegetarian options. I was completely on my own, budget and all. For the first time in my life I had to figure out what to buy, where to buy it, and how much money to set aside for groceries each month. And I know what you’re thinking. My lunch today definitely didn’t seem so exciting, but for a total of maybe .50 cents, I think it did its duty as well as filled my stomach. Besides the fact that I’m a vegetarian living away at a non-vegetarian-friendly school, I’m also an incredibly picky eater. 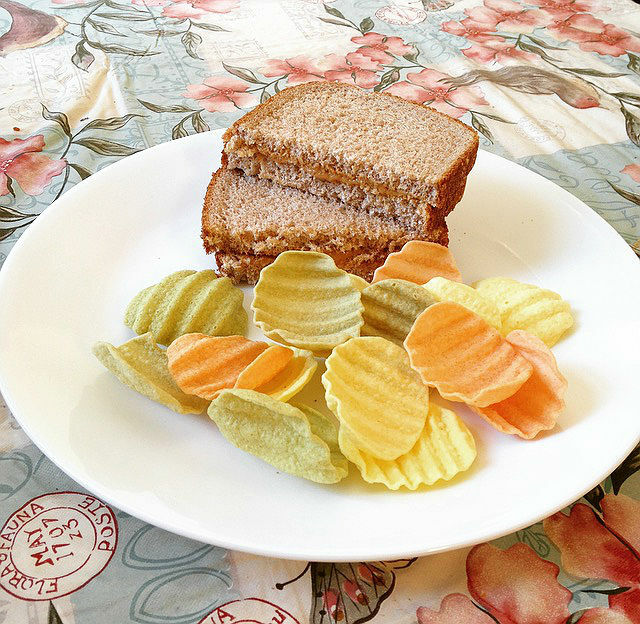 As you can probably tell from my Skippy Natural Peanut Butter (no jelly) sandwich picture with a few of Snyder’s “eatsmart” Sea Salt Garden Veggie chips, it’s clear I’m not one to go too outside of the box with any vegetarian meals. However, I do have a way of staying healthy and happy with my lifestyle. Follow me on my journey through the rest of my time at college and beyond so that I can show you what it’s like to be a broke, picky eater, and vegetarian living away at college. And how I survive it. DISCLAIMER: This post contains affiliate links and using them goes towards supporting the maintenance of this blog. If you choose to use these links, it is much appreciated and thank you! The first 10-15 minutes of writing is never a waste of time! It’s better to spend that time thinking about what you’re going to write rather than writing a heartless/useless post that no one will find interesting. I also try to write weekly, but only when I come up with an idea. I feel that if I’m struggling to pull an idea out of my head, the creativity of my blog post with suffer.